Carhartt footbeds with Insite® Technology are engineered to align the foot in the most natural position. I'm a mechanic and on my feet all day . These insoles are well worth the money . Personally I remove my carhartt boots orig. Insoles and add a thick gel insoles underneath these. That combo for me is heavenly plus being on short side makes me feel like a big boy lol. I replace the gel insoles few times a year . I have 2 of these over 2 yrs old and there still in decent shape but it's time to replace . Great insoles at a fair price ! These are 2 yrs old on my feet 9 hrs a day . I PUT THEM IN BOTH MY 8 INCH AND 6 INCH CARHARTT BOOTS. COMFORTABLE, DURABLE, PERFECT FIT, ABSOLUTELY THE BEST. These are legit. Best money I’ve ever spent. I’ve tried so many insoles. I have to wear extremely uncomfortable safety boots for work and these are by far the best. Only insoles that truly made a difference for me can honestly say they’ve made my life better. Been wearing 3 months now every day long work days and no signs of wear. The doc Scholls I used to buy would be trashed by now. Excellent insole, real nice arch support and cushioned heel. I buy for all work boots Carhartt or not. Last a long time too. I have high arches. Will these insoles help with this? BEST ANSWER: Since each individual is different, we cannot say for sure. 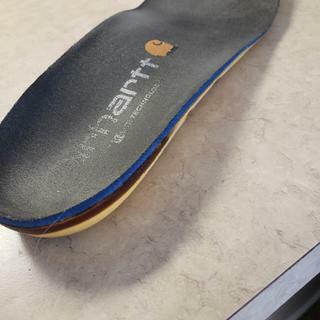 However, we can say that the Carhartt insole is scientifically engineered for its shape to provide arch support. The fit, materials and cushion are designed to provide energy, focus and less fatigue. Does the RUGGED FLEX® 6-INCH COMPOSITE TOE WORK BOOT come with this insole? BEST ANSWER: No, these insoles will only be offered in the Ground Force boots. How long should one set last when used every day for 12-15 hour days? Are they washable? BEST ANSWER: I use the insoles about the same amount of hours 5-6 hours a day. I LOVE them...they offer serious support and are incredibly comfortable. Honestly I spent a good amount of money at the C store and thought eh I should n can prolly do without these. Since the morning I wore them for the first time I was like whoa...these are serious..Carhartt didn't play when they decided to produce these insoles and they put a seriously fine product out there. They also fit my new Chrt shoes I bought at the same time perfectly..Sz 9. I will buy them again. i have my first ones still that came with my carhartt boots for 1 year and 2 months.... they are durable & washable in all temperatures in my experience however the black top layer of the insoles came apart with daily use for that time (the part with the carhartt branding) other than that its still useable for a while i reckon. Hello I purchased mine in August 2018, I am an OTR truck driver i wear mine about 14 hours a day, I’m sure they are washable but I haven’t washed mine because I have not seen the need to. It’s been five months and they still feel great. I’m looking to replace them again probably after a year. 12 to 15 hours a day? yikes! I am guessing maybe 6 months to maybe a full year if you only work four days a week! don't think they are machine washable though. Im a mechanic so on my feet a lot . I'm replacing 2 pairs because there 2 yrs old. They are still in real good shape ! I bot 3 prs of these. Outstanding comfort. My question is are the insoles that come with the boots the same as the insight technology insoles sold separately? BEST ANSWER: The insoles that is in style CMW6174 will not be the same as our Carhartt Insole inserts. can you use these insoles in other workbooks or are they just made for Carhartt? Also do you need to buy the exact size or can you trim them to fit like other insoles that are sold on the market? BEST ANSWER: These insoles can be used in any footwear and can be cut to fit. I also wear the wide 9.5 carhartt shoes which size do i order ? BEST ANSWER: For a size 9.5 wide or medium width you would go with a size 9 insole.